The very Severe Cyclonic Storm ‘TITLI’ moved northwestwards with a speed of about 18 kmph during past 06 hours and lay centred at 1430 hrs IST of today, the 10th October 2018 near Lat.17.2°N and Long. 85.5°E, about 230 km south­/southeast of Gopalpur (Odisha) and 190 km southeast of Kalingapatnam (Andhra Pradesh). today, the 10th October 2018 night on wards along & off south Odisha & adjoining districts of north Andhra Pradesh coasts.Squally winds speed reaching 50-60 kmph gusting 70 kmph is very likely to commence along & off West Bengal coast from today afternoon and gradually increase to 60-70 kmph gusting 80 kmph from today night onwards. 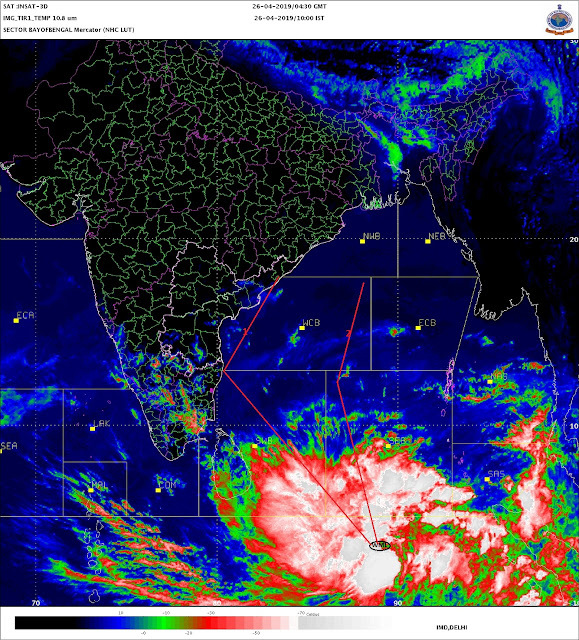 The system will be moving NW now due to the STR in the NW of it. Drier air is also pushing the System Northwards at a faster pace. Titli is expected to cross the coast of Odisha by 11th October. It will then curve NE along the coast. South West Monsoon Likely to withdraw from the country by 15th October. near latitude 14.4°N and longitude 58.7°E. Estimated core pressure 968 mb and core temperature is +11c ...Estimated wind speed at 135-145 kmph. Mumbai will be bearing up with the "October Heat"...Next 2/3 days will be around 35/36c and no meaning full cooling at night. "October Heat" is not a new phenomena for Mumbai..In fact in October 2015 Scruz saw an all time high of 38.6c and in 1968, Colaba saw 39.4c in October. 2018 October has seen 37.6c at Scruz, 2008 saw 37c. So, there is nothing like a specific "rising trend" to say so. What is fate of North East Monsoon? 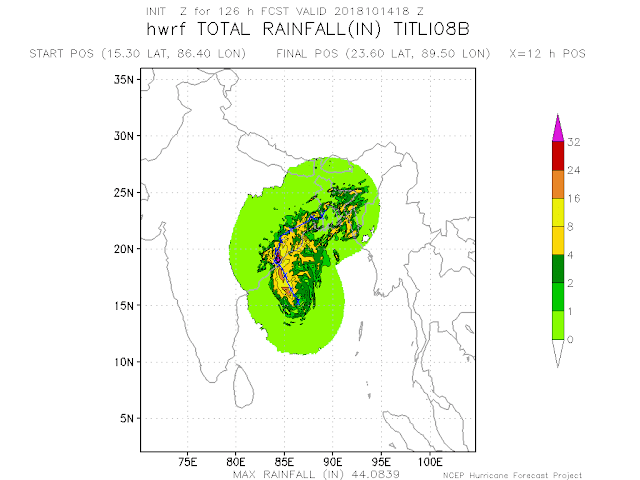 Will this become non-existent-monsoon? Already Rayalseema (Anantapur, Chittor, Cudpaha) have become desert - atleast Thar desert receives more rain! Next to desertification process will be interiors of Tamil Nadu and Karnataka. Since 5 years failure of NEMs. 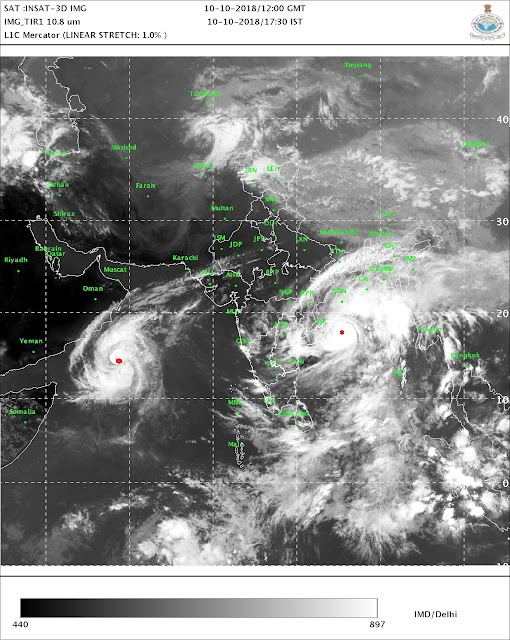 In years to come rogue useless cyclone like Luban,Thitli,Daye will become more prominent leaving NEM in huge distress. More research needs to be done. Only states to benefit will be central India (Orissa,MP,MAHA,GUJ,RAJ) + Northern states they enjoy WDs + new entries middle east Arabia cyclones (oman,yemen_ leaving SE India + Sri Lanka arid. As of Indonesia is also facing drought due to failure of NEM. US weather research is hinting another new cyclone to form near Arabian sea - that means severe hurdle for NEM - season is so short by november starts closing.